Military marriages experience all of the stressors of any other marriage--plus more, such as frequent moves and deployments. 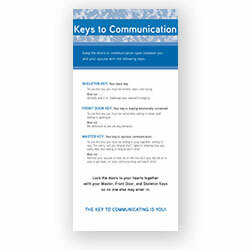 Keep the doors of communication open between you and your spouse with these keys to communication. Bea Fishback is on staff with Military Ministry of Campus Crusade for Christ. She and her husband Jim serve with the ministry in England and are responsible for a successful program of military marriage seminars and HomeBuilders Bible Study groups at American bases there and on the European continent. She is also the author of Loving Your Military Man: A Study for Women Based on Philippians 4:8.